Laurence Parent is an academic, a film maker and an advocate for disability rights. She will be one of the participants in Media@McGill’s Radical Affordances panel on MArch 23. In advance of the event, Parent spoke to the Reporter about her work. Laurence Parent is a PhD student in Humanities at Concordia University. She holds a MA in Critical Disability Studies from York University and a BA in Political Science from Université du Québec à Montréal. She wrote, directed and produced her first documentary film — Je me souviens: Excluded from the Montréal subway since 1966 – which won the Emerging Artist award at the 2010 International Disability Film Festival in Berkeley. She is currently working with the m.i.a. collective – collective of researchers, affiliated with Concordia’s Mobile Media Lab, who are engaged in forms interdisciplinary projects that contain practice-led and theoretical inquiries into the confluences of critical disability studies and mobility studies. 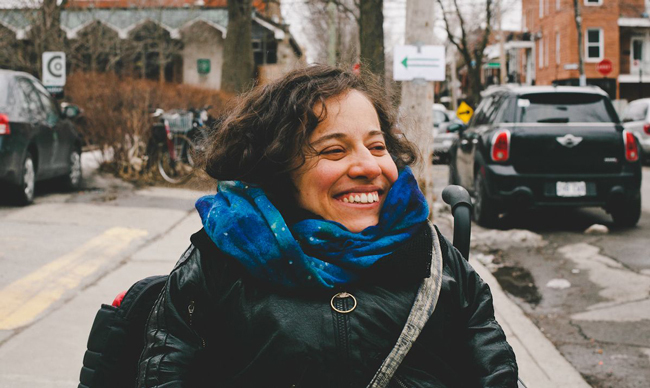 As part of Disabilities Awareness Week, she is participating in Media@McGill’s panel on Radical Affordances. Your doctoral research consists in an oral history project that examines disabled people’s sense of belonging in Montréal and New York City. You have specifically chosen to use mobile media technologies to conduct this research. What new affordances would you say these technologies offer you as a researcher? One of my objectives is to work on something that has the potential of contributing to the fight for disability justice. Through my own work as an activist, I have discovered the power of media representations. Too many media representations view disability as a tragedy. We need more accurate media representations. Mobile media technologies enable me to create media representations from my perspective. The technologies I use are adaptable to my abilities. You recently conducted some “wheeling interviews” during your field research in New York City. What discoveries came out of the process of making these videos? I discovered that the wheeling interviews were perfect to think about what it means to move in the city. So much can be said about movement. The process of conducting wheeling interviews also helped me to think about wheeling as a mobile practice just like walking and biking are. You are a vocal advocate for increasing the accessibility of Montreal’s public transit network. What kinds of media strategies do you employ in your work as an activist? I have been making short videos to document disability discrimination in Montreal’s public transit network. The main objective is always to tell stories from disabled people’s perspectives. I am using social media a lot. I believe one of the things we first had to do was to reach out to other disabled people. Many people are isolated. Disabled people need to see other disabled people facing the same obstacles they face. They need to know that their story matters. I need to know that my story matters. Based on your interviews, what would say are the top three changes Montréal and New York City could make to augment people with disabilities’ sense of belonging in these cities? For details about the 23 March 2015 panel on “Radical Affordances: Emerging Scholarship, Art, and Activism at the Intersection of Media and Disability Studies,” visit media.mcgill.ca. You can also watch a selection of Laurence Parent’s videos at www.radicalaffordances.ca.